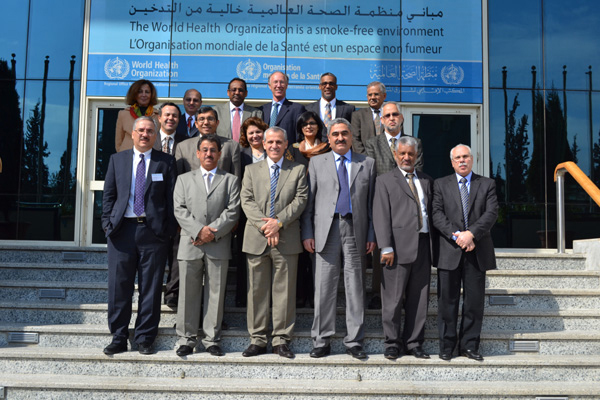 March 09, 2012: The new Regional Director of the Eastern Mediterranean Region of the World Health Organization convened a high level expert meeting on health priorities in Cairo on March 1-2 just after assuming office. Heartfile President, Dr. Sania Nishtar was amongst the select group of experts invited to reflect on the WHO reform process and priorities for its scope of work in the future. March 06, 2012: 125 deaths were recently reported in Pakistan as a result of fatal bone-marrow suppression subsequent to contaminated substandard drug intake. These drugs were available to the poor free of cost from a public cardiology pharmacy. Our analysis of the situation has just been published in The Lancet and in the News International. Currently, there is just one drug quality testing laboratory in each province but most are either inoperative or lack infrastructure, equipment, or qualified competent and experienced staff. It is critical that the government invests as well as attracts investments in this area. An appropriately structured arrangement can have public-private resonance, offering a commercially viable investment opportunity. A sustainable system can also be developed which serves a public goal by ensuring quality of medicines. This is also a time for a deeper policy review of the problem of substandard medicines. Pakistan today ‘boasts’ of 709 pharmaceutical units but none of them are FDA-certified. A large number of manufacturing units have been set up on shoe-string budgets and are quality deficient from the outset. Many experts are of the opinion that the deterioration in the pharmaceutical manufacturing standards, amongst other things, is the result of the former MoH’s irrational policy – also currently in effect – of linking licensing of products to having one’s own manufacturing facility. This forces every new supplier entering the market to set up their own manufacturing facility to get into the business. In some cases, these units are name plate operations. Many never have the volumes/capacity utilization required to achieve CGMP standards. While they put in place brick and mortar, other critical ingredients are lacking – professionals with competency, robust and validated systems and periodic audit. Most units are unable to undertake the requisite investments in manufacturing equipment and infrastructure to upgrade themselves to international levels. As a result, substandard units have burgeoned, over time. These systemic limitations have also been recognised by some factions within the local industry itself, as was evidenced by the resignation of the PPMA (Pakistan Pharmaceutical Manufacturers’ Association) acting chief, as reported in newspapers on Feb 17. The policy of lumping together “manufacturing license” and “commercial supplier’s license” is in deviation from the Drug Act (1976) Rules, which envisage a tolling policy allowing companies to have their products manufactured at any licensed manufacturers’ premises. Use of tolling can create an incentive for manufacturers to raise their standards and processes for both manufacturing and also quality control to international levels. The existing policy should be reviewed in light of the recent debacle. The government must lay down minimum standards for manufacturing units with WHO’s help and should stipulate a timeline for their achievement. It is in the interest of the industry to support such standards and open themselves to licences’ review, rather than resist them as was indicated in a PPMA statement, quoted in newspapers on Feb 18. In terms of the way forward there is also the imperative to revise the Drug Act – the fourth point. The Act’s weak enforcement is the subject of much debate, but it is not fully appreciated that the law has exploitable covenants, particularly in relation to “warranty of sale”. Traditional medicines prescribed by 130,000 practitioners remain outside the law’s purview. A draft bill on traditional medicines has been in the parliamentary review pipeline for the last 10 years without action, for no apparent valid reason. These weaknesses have opened an avenue for collusion across the entire layer of provincial drug regulation relating to distribution, pharmacy sales and storage and have encouraged back street production of counterfeit – issues outside of the scope of today’s comment. Lastly, it must be appreciated that much would depend on the capacity and effectiveness of the new DRA. Most of the tasks outlined above and many others would fall within its remit. The DRA must be appropriately resourced as a starting point. The government has been collecting a 1 percent tax on gross income from all pharmaceutical manufacturers since the early 70s with a view to channelling funds towards a ‘research fund’. Since the latter has not materialised fully, these billions could be used as an initial input to resource DRA’s institutional building effort in these times of severe financial hardship in Pakistan. The DRA’s governance structure should be carefully established. It would be critical to learn from past mistakes in establishing independent regulatory authorities, where controls still rest with the government and where under-resourcing and lack of appropriate accountability frameworks create space for collusion, inefficiencies and commandeering by vested interest groups. Meticulous transparency is needed in this respect. The EMA’s recent initiative is an example of such transparency – from March 1, 2012 the EMA will start to publish information on applications for centralised marketing authorisation for human medicines that it has received for evaluation. One of the key responsibilities of a government is to protect its citizens, and if the present government does not step up to make radical changes it will be blamed when more tragedies inevitably occur. The new DRA is a window of opportunity – by establishing it the government has taken the right first step but much more needs to be done quickly! In 1937, more than a hundred people died in the United States as a result of using a drug formulated with a toxic solvent in what came to be known as the Elixir Sulfanilamide Tragedy. The incident was a wakeup call for the then US administration and led President Roosevelt to sign the Food, Drug and Cosmetic Drug Act into Law in 1938. The new law significantly increased federal regulatory authority over drugs and mandated the creation of the US Food and Drug Regulatory Authority (FDA). The FDA was created as a federal entity in the United States’ federal system, even though health was a state subject. Since then, the FDA has become a global reference institution and has prevented the occurrence of similar events. For example, in the late 1950s and early 1960s, when the Thalidomide horror struck in the rest of the world with more than 10,000 children in 46 countries born with limb deformities, as a result of their mothers using the drug Thalidomide, for morning sickness, the US was largely insulated as it had already refused to authorise Thalidomide for market use because of concerns about the drug’s safety. Although the United States and Pakistan are not comparable from a capacity or a resource standpoint there are important lessons to be learnt. Eight decades on, a similar situation has occurred in Pakistan. A hundred and fifty individuals are reported to have died as a result of drug-induced fatal bone marrow suppression. Pyrimethamine-contaminated Isosorbide 5-Mononitrate (a medicine used for the treatment of heart disease) dispensed from a public sector hospital pharmacy in Punjab was identified as the culprit drug. The hospital itself has a large catchment area, so the actual number of people who may have suffered could be higher than the known deaths. Amidst the media frenzy around the issue, speculative opinions, and reckless punitive action, clarity is needed in three respects: where does the onus of responsibility lie? What is the potential fallout? And what needs to happen next? In terms of responsibility, it must be appreciated that this is clearly both a failure of manufacturing and control systems at the level of the manufacturer as well as regulation. This notwithstanding, its determinants are complex. Collusion was systemically pervasive all along in granting manufacturing licenses, drug registrations and monitoring of quality with inspectors complicit in fostering deliberate inattention to oversight at the manufacturing level. It appears that the situation deteriorated further after the 18th Constitutional Amendment. When the latter abolished the Concurrent Legislative List, devolution of “drugs and medicines” was a mistake. Provinces started calling for provincial drug regulation, in complete deviation from international best practice. There was a clear way forward to mandate the federal government and build further on the 2005 framework for the establishment of an independent Drug Regulatory Authority (DRA), but things got complicated as the “drug regulation turf” became an additional ground for the political fight between the federal government and the government of Punjab. As a result, seven months passed since the Ministry of Health’s (MoH) abolition, and the process of creating the DRA did not come to fruition. Meanwhile, however, the provinces used a constitutional instrument to grant the federal government a temporary regulatory mandate, which is where the Drug Cell was placed after MoH’s abolition-a fact relevant to tracking the onus of responsibility. It was only in compliance with the Superior Court’s ruling earlier this month that the DRA has been established, for the time being, in theory. The three-fold fall out of the debacle should be fully appreciated. The tragic mortality has adversely impacted both domestic as well as international confidence. Consumers and doctors are losing faith in the safety of locally produced medicines. Although it is early to assess the quantum of impact vis-à-vis exports, signs are worrying. If left unaddressed, this could render an irreparable blow to Pakistan’s local pharmaceutical industry. Many may be producing good medicines but at the moment we have no way of demonstrating that they are GMP (Good Manufacturing Practice) compliant and produce quality tested medicines. So what needs to happen next? Four steps are being outlined here. First, there has to be a high level international independent inquiry, including experts from FDA, the European Medicines Agency (EMA), the Australian Therapeutic Good Administration (TGA) but also countries like Malaysia, Singapore and Indonesia, as well as the World Health Organization (WHO). It is critical to ascertain what really happened and place findings in the public domain. Secondly, from now on there must be transparency in all GMP inspection reports. The WHO Prequalification site publishes all inspection reports. For example, the report from Kenya is illustrative (http://apps.who.int/ prequal/WHOPIR/WHOPIR_Universal13-16June2011.pdf). There are many others at http://apps.who.int/prequal/ in the section labeled inspections. All locally produced products that are widely used in Pakistan should be tested and the results posted on a publicly accessible website, such as the one the Global Fund for AIDS, TB and Malaria maintains at the page Global Fund – Pharmaceutical Quality (http://www.theglobalfund.org/en/procurement/quality/pharmaceutical/) in the section labeled “pre shipment testing”. Each cell in the spreadsheet links to a Certificate of Analysis. Experts will confirm that testing does not ensure quality, but when combined with GMP inspections and regular checks, it does go a long way. Capacity has to be built in order to implement such stipulations.